True North warrants that all materials supplied are of accepted standards of quality and grade and are as described in the company’s price list and specifications for the type of building purchased and that any defective material will be repaired or replaced, at True North’s discretion, without charge upon written notice within 12 months of delivery. No provision is made herein for, checking, twisting or warping of the wood which would be considered a natural characteristic. True North warrants that all factory workmanship in the various components, assemblies, and other materials supplied has been completed in a good and workmanlike manner in keeping with accepted standards of manufacture and that any faulty workmanship will be corrected without charge upon written notice within 12 months of delivery. No warranty covers, and True North Log Homes, Inc. shall have no liability for, any costs or expense of any labour, materials refinishing or painting associated with the installation, removal, or replacement of the defective product or component part, or for any costs, expenses or damage due to accident, fire, act of God, or other cause beyond the control of True North Log Homes, Inc., the building’s contractor, or their agents. Repair, replacement, or refund, as provided under any True North warranty, is the exclusive remedy of the Purchaser and the choice is at the discretion of True North Log Homes Inc. 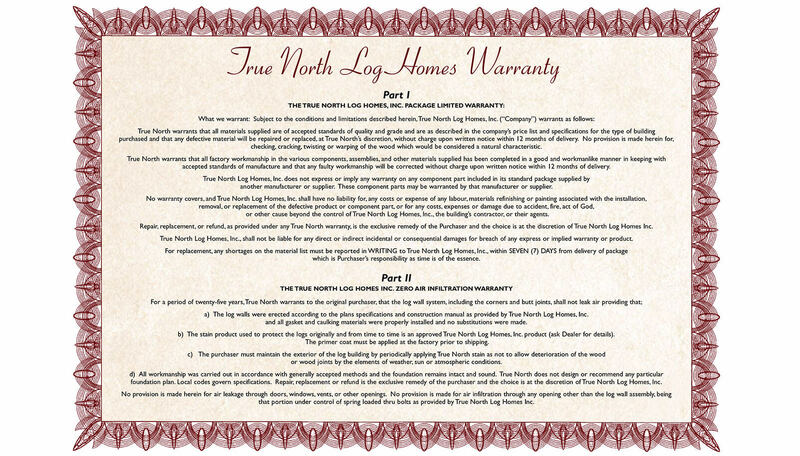 True North Log Homes, Inc., shall not be liable for any direct or indirect incidental or consequential damages for breach of any express or implied warranty or product. For replacement, any shortages on the material list must be reported in WRITING to True North Log Homes, Inc., within SEVEN (7) DAYS from delivery of package which is Purchaser’s responsibility as time is of the essence. The log walls were erected according to the plans specifications and construction manual as provided by True North Log Homes, Inc. and all gasket and caulking materials were properly installed and no substitutions were made. The stain product used to protect the logs originally and from time to time is an approved True North Log Homes, Inc. product (ask Dealer for details). The primer coat must be applied at the factory prior to shipping. The purchaser must maintain the exterior of the log building by periodically applying True North stain as not to allow deterioration of the wood or wood joints by the elements of weather, sun or atmospheric conditions. All workmanship was carried out in accordance with generally accepted methods and the foundation remains intact and sound. True North does not design or recommend any particular foundation plan. Local codes govern specifications. Repair, replacement or refund is the exclusive remedy of the purchaser and the choice is at the discretion of True North Log Homes, Inc.
No provision is made herein for air leakage through doors, windows, vents, or other openings. No provision is made for air infiltration through any opening other than the log wall assembly, being that portion under control of spring loaded Log Lock Compression System as provided by True North Log Homes Inc.